Artikla trenutno ni na zalogi. Spodaj se lahko prijavite in poslali vam bomo obvestilo, takoj ko artikel prispe na zalogo. Obvestilo boste dobili samo za ta artikel. Imagine a Raspberry Pi Zero W. Now add a professionally soldered header. Boom, that’s the Raspberry Pi Zero WH! It’s your same great-tasting Pi, with a brand-new…crust? It’s perfect for everyone who doesn’t own a soldering iron or who wants the soldering legwork done for them. What can’t you do? Am I right?! The small size of the Zero W makes it perfect for projects with minimal wiggle-room. In such projects, some people have no need for GPIO pins — they simply solder directly to the board. 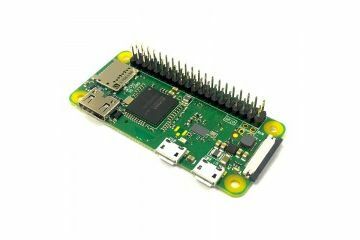 However, there are many instances where you do want a header on your Zero W, for example in order to easily take advantage of the GPIO expander tool for Debian Stretch on a PC or Mac. The GPIO expander setup is just one of a multitude of uses for a Raspberry Pi Zero W with a header. You may want the header for prototyping before you commit to soldering wires directly to a board. Or you may have a temporary build in mind for your Zero W, in which case you won’t want to commit to soldering wires to the board at all. - Tiny Current Draw ~ 140mA at 5V!